Our Winter Education Report: Can Comprehensive High-Schools Succeed, highlights the transformational journey of two high schools., J. Percy Page, in Edmonton, Canada, and Springfield High School in Springfield, Illinois. While much of the recent literature on high-schools is encouraging redesign into smaller units, it may be important to note that larger comprehensive high schools can still be successful in certain settings and under certain conditions. These two school stories are not unlike the situations TLC consultants encounter when working in other American and foreign high schools. In fact, the challenges are so common that these schools could have been located in any urban area across the country. While these are detailed stories of two high schools in districts we have worked in, the rest of the elementary, middle and high schools in these districts, have also made significant gains. We encourage you to check our website: www.targetedleadership.net for other school and district results. 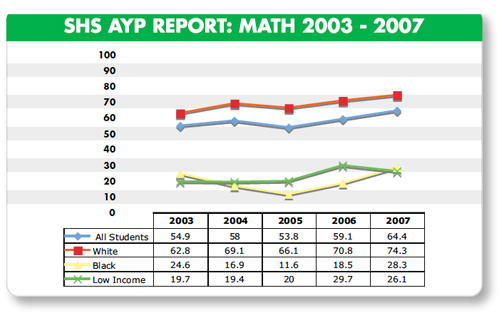 The J. Percy Page, and Springfield high-school stories demonstrate that strong collaborative leadership, a targeted plan of action based on data and focused on student academic needs, as well as consistent implementation of a Professional Learning Plan, targeting promising practice, can lead to an increase in student achievement results even in larger comprehensive high schools. Setting and living high academic expectations for all students in the school. Developing expertise to analyze the academic and attitudinal student data on an on-going basis. Implementing a well-developed, and deeply rooted system for monitoring and adjusting instructional practices based on student achievement results. These criteria can best be established, and their implementation monitored, at the school site. Even-though many of the criteria for student performance are set at the district and state level, individual schools need to set their own targets within the requirements set by others outside the school building. The set of criteria listed above are the easiest to generate and often high schools have all or some of them in place. However, due to uneven implementation and insufficient monitoring, they fail to achieve the projected results. Each staff member believing that all students can achieve and an understanding that they will need to adjust their instructional methods to improve results for every student. A commitment from students that clearly indicates that they support and welcome the rigorous standards set for their academic achievement. Students accepting the responsibility of engaging in the learning process, of knowing where and how to access support, and fully able to articulate how they are learning. A clear communication system both within and outside of the school to ensure that there are no surprises for anyone and that the family is part of the achievement process for success. Assessment practices that are transparent and focused on students demonstrating their learning. Students able to access their grades and determine their progress at any time. Support systems in place for both teachers and students, all learning together. How do schools address the Academic and Cultural Criteria needed for academic improvement? What follows are two school stories that show how successful high schools have addressed these two sets of criteria using different approaches. The first school is J. Percy Page High School in Edmonton, Alberta, Canada. It is a school with 1,100 students. They achieved significant improvement in student course completion and graduation rates, as well as improved attitudinal and community satisfaction ratings by rebuilding the school culture from within. The second school is Springfield High School in Springfield, Illinois with a student population of 1,200 students. This school had a well-established positive image and they used external forces and support to help them improve their achievement levels. J. Percy Page has an ethnically diverse student population. The school was opened 20 years ago in a “state of the art” building and even though it had a good beginning, over the years, the academic achievement of the students steadily decreased. This caused a ripple effect in the community and the school’s reputation quickly deteriorated along with student attitude and staff morale. The Edmonton School District was not satisfied with the academic achievement level of the students at J. Percy Page and after some analysis and monitoring of student assessment data, they decided that a change in administrative leadership was needed to reverse the trend. They appointed a new principal to lead the school with the expectation that results would be improved. The newly appointed principal began to implement the changes needed by first building a leadership team at the school that included representatives of all parts of the staff, department heads and the administration team, the business manager and the school librarian. The librarian was included in the team in order to provide access to the educational research to support the changes that were being implemented. This new leadership team was committed to the belief that all of the students could learn and achieve and became the catalyst to get other staff members on board. The new principal decided that the first task the team needed to address was to gain expertise in data analysis and began this process by engaging district staff experts (director of assessment) in the training of the leadership team. The team was trained in all aspects of data analysis and spent every second week of the month examining the academic data, considering and questioning the practical interpretation of the data, and learning how to apply what they learned from the data to change their practice. The assessment director was invited to serve as one of the school’s “critical friends”. The critical friends were external to the school staff and included an executive director from central services, the director of assessment for the school district, and a retired curriculum expert from the local university. Their role was to serve as outside eyes for the school and to support and question progress and procedures. Protocols for teachers were put in place to ensure that rigorous teaching standards were being implemented and the members of the leadership team were the first to pioneer the new strategies in their classrooms. To ensure that the protocols were “visible” and could be readily observed each department organized classroom “walkthroughs” so that other teachers could see the protocol in practice. Even though every department had to implement the protocol, each had a voice on how the protocol would be implemented. While the leadership team was being trained and developed, the school’s administration team identified clear student behavior norms and expectations. Administrators became highly visible in the school, getting to know the students and making sure that the expectations for students were being met. After a few weeks of following through and monitoring the implementation of these new norms and expectations, the word was out: “It’s different here!” The students soon internalized the process and realized that the staff was vested in their success. Many students were able to verbalize the following: “the staff care about us and they will enforce the school rules because they are in place to help us.” With training and support from the administration, It took only one semester for the leadership team to start trusting the work and their colleagues and begin operating as a high performing team. 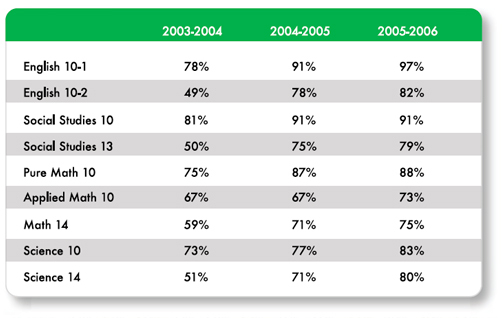 Overall course completion rates at all grade levels (10 through 12) increased from 86.5% in 2003-2004 to 95.6% in 2005-2006. Springfield High School has 1,200 students and was becoming more and more ethnically, and socio-economically diverse. The school had always enjoyed an excellent reputation and the results were the best among the three high schools in the district. In recent years, however, the staff had become complacent and key members of the staff acknowledged that there was room for improvement in student achievement results, particularly for students of color. In order to improve academic achievement results for all schools, the central office in Springfield adopted a system-wide reform effort that all three high schools chose to became a part of. This system wide effort involved the use of an outside consulting firm that provided training around a targeted reform framework as well as coaching for school and district administration. The outside consultants helped the school develop and implement systems and protocols in the school that addressed both the academic and cultural criteria identified in this article as key in any improving school. The principal of Springfield high school used this external consulting group to reform the school. The faculty council became the instructional leadership team. This instructional team and the principal attended the regular district trainings provided by the consulting group. In order to build capacity beyond the leadership team, the principal also strategically rotated key staff members through these trainings and thus expanded the expertise of all staff. The leadership team examined all of the systems in place in the school and slowly but surely changed the school culture to demonstrate that “all students can learn.” The school targeted an instructional are in literacy for school-wide improvement. They sought support in this effort from the district’s director of literacy. They received assistance in finding suitable high school research material in literacy that would help teachers select promising literacy practices. Training would need to be provided for all staff in these practices. The principal also made use of “critical friends” to help move the school’s agenda forward. The critical friends included district office personnel, an outside consultant and a school improvement coach. The principal planned and created a plan of action with the “Friends” that would address instructional improvement. Key to the success of this effort was that the principal became an integral member of his school’s leadership team as well as an active participant in the district leadership team guiding the implementation of the system-wide reform. A summer school program was established for freshman students who were identified as needing additional support. These students were followed and monitored as a cohort throughout the entire school year. They received extra support and a different approach to instruction. To assist the staff with new changes, the principal used key staff members from the staff who had retired, as leaders in the school. He recruited them to return and work in supplementary roles in support of the school reform effort. The principal also created a sense of urgency amongst staff and students by publicly displaying achievement data results in the school hallways. This was difficult at first, because it had never been done and many staff felt threatened. The staff had not traditionally shared data, let alone seen the school data displayed. Reluctant staff members shared many reasons for why the data should not be displayed. One example of a common excuse given by staff members was that there were no tack strips on the walls for data charts to hang from. The director of facilities rapidly remedied this problem by quickly installing tack strips on the walls. Once the tack strips were in place, the principal worked with the instructional leadership team to analyze the data and post it throughout the school in a format that was clear and easy to read. The results were immediate. Staff and students became very interested in the data. The students asked many questions and the teachers immediately requested more data and training for how to improve results. The barrier was eliminated and the staff began to buy-into this practice. In order to celebrate short wins, the principal decided that he would invite outside visitors to come into the school to view the changes and share what they saw with the staff. He offered to showcase the school to visitors and to other schools in the district. He asked teachers to volunteer their classrooms for visits. The feedback was so positive that opening up classroom doors to view teacher practice became commonplace throughout the school. It was a natural springboard for teachers to collaborate on lesson plans, assignments and assessments. The school’s good reputation developed a new shine and the difference was evident among students and staff. In this case, the exceptional improvement in results was all about relationships. The school developed a positive relationship with the district office and was willing to receive training, coaching and support from the consulting group. Finally, the principal’s openness to change along with his ability to build collaborative relationships with staff, parents and central office changed the school culture from one of defensiveness and complacency to one of openness and continuous improvement. Springfield High School is scoring well above the state and national averages on the ACTs. Following are some of the systems and processes the school staff implemented at Springfield High-School in order to improve teacher practice and increase student achievement. Shirley Stiles is a Senior Consultant with Targeted Leadership and most recently served as the Assistant to the Superintendent of thte Edmonton Public Schools in Alberta, Canada. In her career as an educator, Ms. Stiles has been a classroom teacher, Social Studies and Student Activities department head, counselor, consultant, housemaster, high- school principal, and assistant superintendent in the Edmonton Public School System. Amalia Cudeiro, Ed.D. and Jeff Nelsen, Ph.D. are co-founders and partners with Targeted Leadership Consulting. Both have served as teachers, principals, and central office administrators and have provided training and coaching to more than 2,000 principals and school leadership teams over the past decade, helping schools and districts set and meet rigorous, measurable student learning goals.